Title: The Shade of Byron: a mock heroic poem, containing strange revelations not hitherto disclosed, with copious notes and references ... A preface, with the author's comments on the so-called true "Story," by Mrs. Stowe. 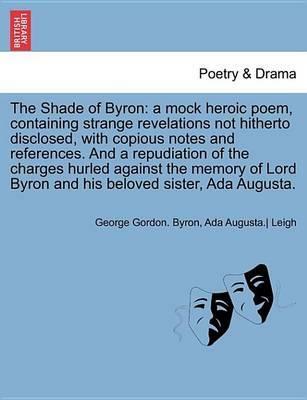 And a repudiation of the charges hurled against the memory of Lord Byron and his beloved sister, Ada Augusta. (Second edition. ).Publisher: British Library, Historical Print EditionsThe British Library is the national library of the United Kingdom. It is one of the world's largest research libraries holding over 150 million items in all known languages and formats: books, journals, newspapers, sound recordings, patents, maps, stamps, prints and much more. Its collections include around 14 million books, along with substantial additional collections of manuscripts and historical items dating back as far as 300 BC.The POETRY & DRAMA collection includes books from the British Library digitised by Microsoft. The books reflect the complex and changing role of literature in society, ranging from Bardic poetry to Victorian verse. Containing many classic works from important dramatists and poets, this collection has something for every lover of the stage and verse. ++++The below data was compiled from various identification fields in the bibliographic record of this title. This data is provided as an additional tool in helping to insure edition identification: ++++ British Library Byron, George Gordon. ; Leigh, Ada Augusta. 1871 vol. ; 8 . 11650.f.3.